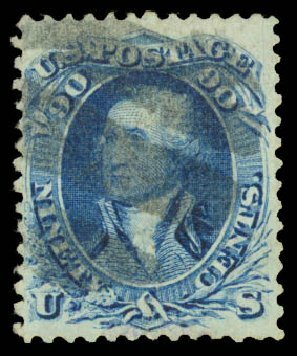 USA (Scott 101) 1867 WASHINGTON ‘F’ GRILL 90¢ BLUE Fresh color, very fine appearance, small thin spot. 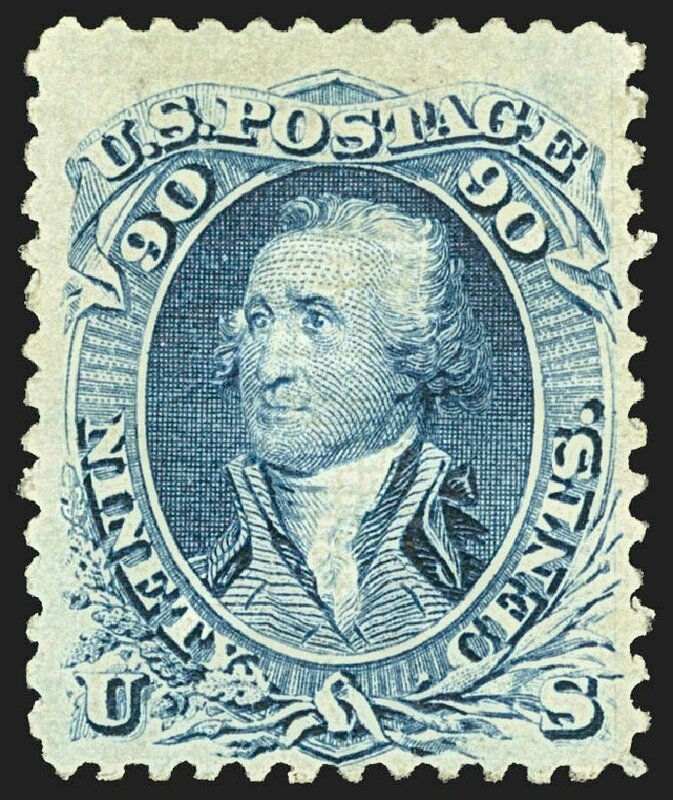 An unusually nice example of this stamp which is scarce, well centered with original gum. Cat $14500. 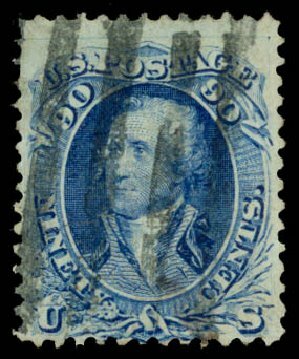 U.S.; General Issues, 1867, 90¢ Blue, F. Grill, #101, o.g., fresh and Fine, PSE (2015) cert. Scott $14,500. Estimate $2,000-2,300. 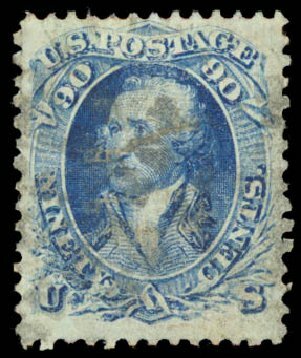 o U.S.; General Issues, 1867, 90¢ Blue, F. Grill, #101, used, “with small faults, incl. 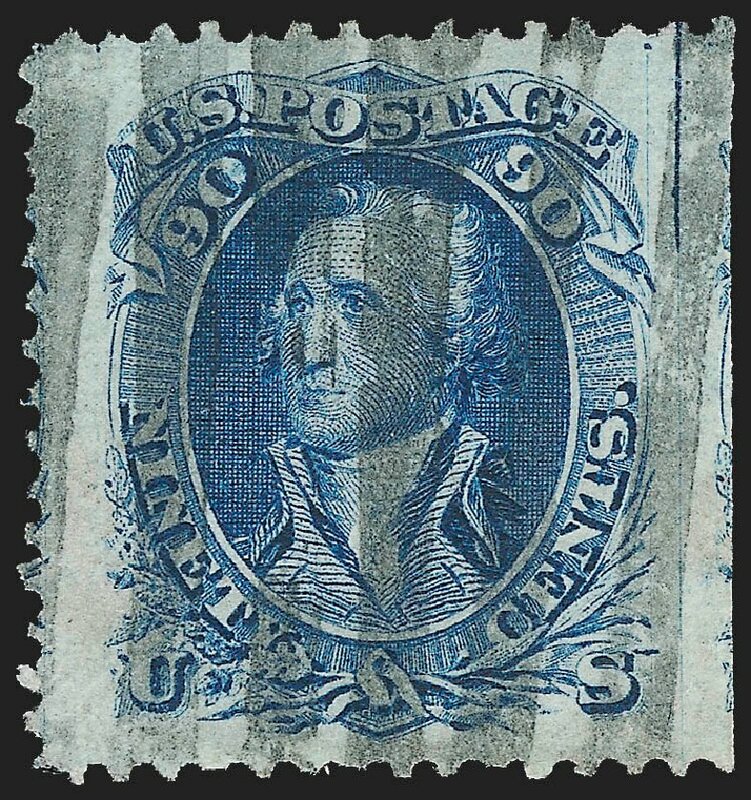 an added perf at upper left”, Fine to Very Fine appearance, PF (2014) cert. Scott $2,250. Estimate price $270-325. 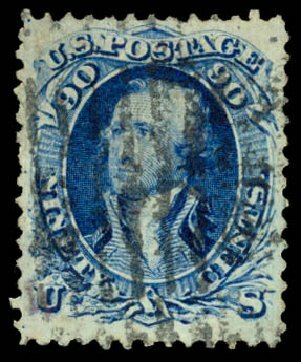 1867, 90¢ blue, F. grill (Scott 101), black cancellation, exceedingly fresh example that’s completely sound in all respects, Fine. Scott $2,250. Estimate $500 – 750. 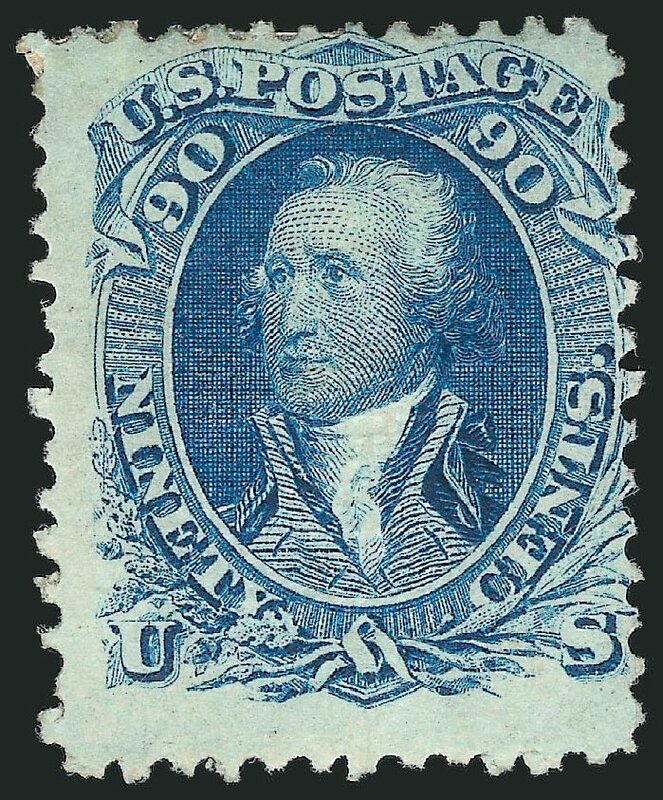 1867, 90¢ blue, F. grill (Scott 101), segmented cork cancel, clear grill impression; tiny tear at bottom, Very Fine appearance. 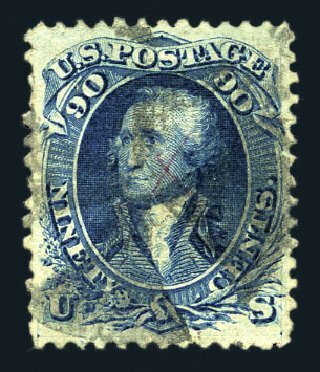 Scott $2,250. Estimate value $500 – 750. 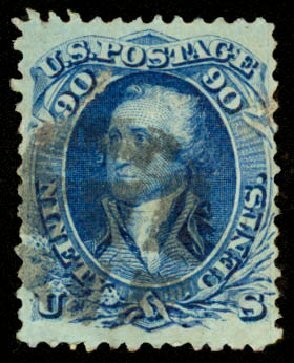 1867, 90¢ blue, F. grill (Scott 101), neat black cancellation, vivid and bright example of this tough stamp; diagonal crease and a tiny thin at upper left, otherwise Fine to Very Fine, with 2013 Weiss certificate. Scott $2,250. Estimate value $400 – 600. 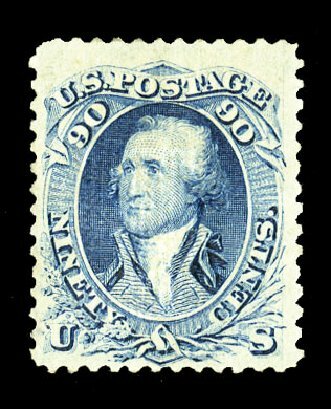 1867, 90¢ blue, F. grill (Scott 101), neat black cancellation, “economy model” of this elusive stamp, with deep rich color, available at a fraction of it’s catalog value; three thin spots, reperforated at right, Fine appearance. Scott $2,250. Estimate price $300 – 400. 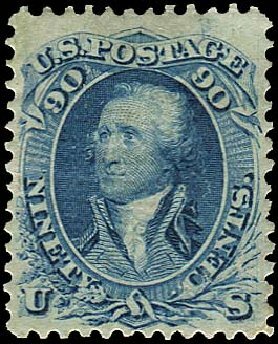 1867, 90¢ blue, F. grill (Scott 101), black cancellation, premium example with captivating color, scarce stamp, Fine to Very Fine, with 1986 P.F. certificate. Scott $2,250. Estimate value $750 – 1,000. 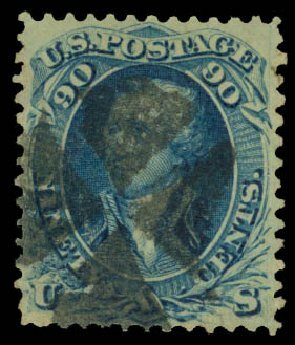 1867, 90¢ blue, F. grill (Scott 101), black cancellation, nicely centered stamp with fabulous deep rich color; reperforated at right, and a repaired tear at bottom, otherwise Very Fine, with 2015 Weiss certificate. Scott $2,250. Estimate price $500 – 750. 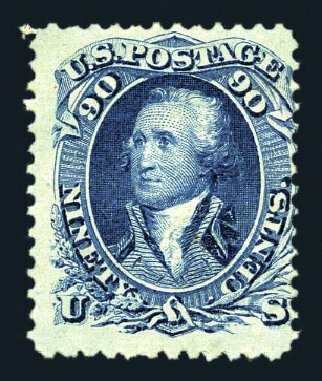 1867, 90¢ blue, F. grill (Scott 101), neat black grid cancellation, particularly well centered example with exemplary color and impression, a most impressive 90 cent F grill that is rarely found with such wonderful attributes, Very Fine to Extremely Fine, with 1988 P.F. certificate. Scott $2,250. Estimate price $1,500 – 2,000. 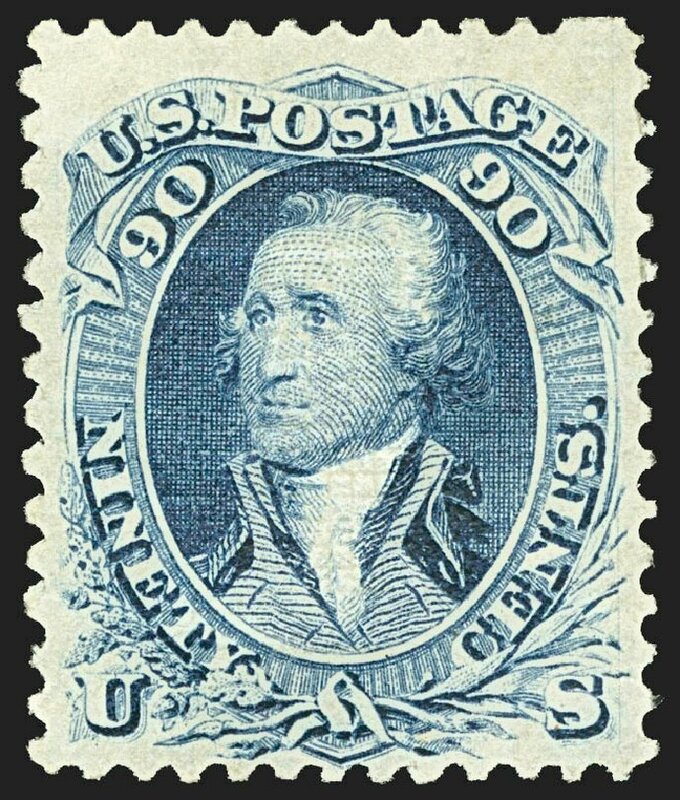 90c Blue, F. Grill (Scott 101). 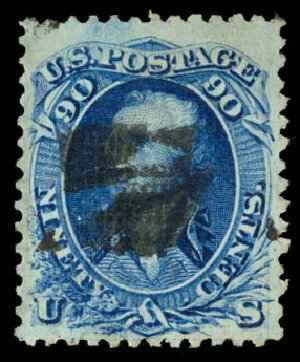 Slightly disturbed original gum, deep rich color, clear grill, tiny thin specks at top A FINE APPEARING AND RARE ORIGINAL-GUM EXAMPLE OF THE 1868 90-CENT F GRILL. A difficult issue to obtain with original gum.